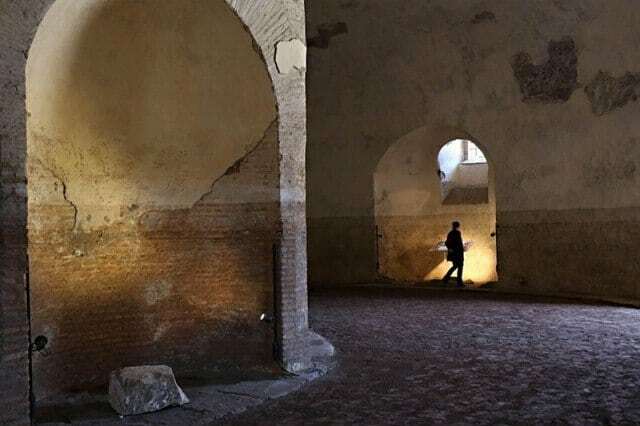 As if there are not already enough things to do and see in Rome, yesterday (Monday 9 June) another Roman period site re-opened its doors to the public. Having been closed for the last 20 years, and after a substantial restoration project, visitors to Rome can add the ‘Mausoleum of Romulus’. 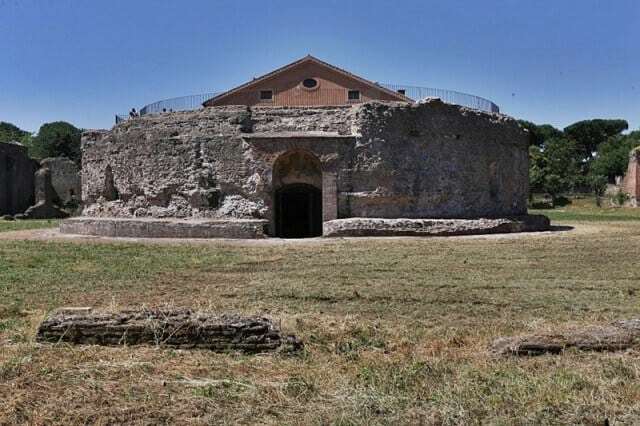 Situated on the Via Appia, between the church of St Sebastian and the tomb of Cecilia Metella, the mausoleum is part of a complex of buildings built by Emperor Maxentius at the beginning of the 4th century AD. Today the front steps and entrance porch of the large, circular tomb are obscured by a 19th century farmhouse. The vaulted burial chamber behind the farmhouse with its semi-circular niches is largely intact despite being used as stables in the past. There is no trace of a floor, neither are there remains of any decoration. This has lead archaeologists to suggest that the tomb was never finished. Although known as the ‘tomb of Romulus’, archaeologists are still not sure whether Maxentius had the tomb built specifically for Romulus (who died in 309 AD), or Maximiam (died 310 AD), or for his whole family including himself. The many niches would have ensured the tomb could hold a number of sarcophagi. The circular tomb is at the centre of a rectangular area, enclosed by heavy brick walls, adjacent to the Via Appia. On the hill behind the mausoleum precinct are the remains of a set of palatial style buildings, thought to be Maxentius’s villa. Very little remains of the villa, which was built on the platform of a late Republican villa. The villa overlooks, and has a corridor to, an extremely well preserved, full scale circus. The corridor from the villa leads directly to the Imperial box. And a number of other typical features of a circus can still be seen here, including the starting gates (each wide enough to hold a chariot lead by four horses), the towers that flank the row of starting gates, the judges box, and the spina. This is one of the best preserved circus’s, and is in a better condition that the Circus Maximus in the city. At 503 metres long, it is amongst the largest of all the known circus’s – nearly as large as the Circus Maximus. Why the circus is juxtaposed with the mausoleum is not fully understood. It may be that the function of the entire complex was funerary in nature, as rituals of chariot racing were closely associated with cycles of life and death. I am proud to be able to restore an absolute jewel of our archaeological heritage to Romans and to the millions of tourists who visit Rome each year. The reopening of the mausoleum of Romulus can certainly be considered another step towards realising our most ambitious aim: creating the World’s biggest archaeological park, stretching from the slopes of the Capitoline hill in central Rome all the way here to the Appia. A series of photographs from the opening event, including some of the features of the circus, can be seen on La Repubblica’s website. Where is the Mausoleum and Tomb of Romulus? Beyond the Appia Gate lies the archaeological parks of the Appia Antica – and the Tomb of Romulus is on the east side of the road, diagonally opposite (and some) the church of St Sebastian – but before the Tomb of Cecilia Metella (which is also on the east side of the Via Appia Antica. Getting to the Via Appia Antica sites and the Tomb of Romulus is fairly easy. From either the Circus Maximus or the Baths of Carcalla, you can get a bus into the park; it is not advisable to walk from the Baths of Caracalla – I tried and turned back. There is no pavement and cars, buses and light trucks make the first stretch very dangerous. All the practical information for visiting the Park of the Appia Antica, including opening times, tickets, as well as the available services and facilities can be obtained on the park’s website. One of the services on offer are bicycles for hire – get yourself there early and have a leisurely day in the archaeological park. The website includes a number of itineraries for those on foot, or for those cycling. The sites along the Appia Antica do participate in the Roma Pass scheme. • Need a good archaeological guidebook: Rome Oxford Archaeological Guide by Amanda Claridge. • To save money on entrance fees and public travel: get a Roma Pass, and use it strategically. • See my list of the top attractions to visit in Rome – which not surprisingly includes the Via Appia Antica. Whenever I finally travel to Rome, seeing this will be at the top of my list, as I was always fascinated by the story of the creation of Rome, or 100% true tale if you ask some Romans. Once, a man who used to be Roma footballer told me that he knew Romulus’ story to be true. I had a good laugh but I honestly think he was serious. Thanks for sharing and adding it to my list now!